Stand at the junction of Jalan Raya Ubud and Jalan Monkey Forest and you’ll find yourself at the very heart of Ubud – literally yards away from the royal palace, the town temple, and the Ubud Art Market, one of the most popular traditional markets in Bali. The princes of Ubud were – and are – great patrons of art, and the market was an extension of the local nobility’s sponsorship of artists. For over a hundred years now, craftsmen from nearby villages have been bringing their wares to Ubud market to sell. As the tourist tide in Bali grew, word got around that Ubud market offered a better deal than most: the close access to craftsmen’s villages meant that tourists were getting real master’s handiwork at lower prices. And so it is today; no shopping trip in Central Bali is ever complete without an hour or so browsing through the art market’s stalls. (The area’s art galleries and spa experiences can wait!) Check out the images below to experience a virtual walk through the Ubud art market’s aisles of inexpensive art. The Ubud art market is open for business as early as 8am; if you value your time and money, come to the market at opening time and get your shopping done before the tourist rush begins at 10am or so. You can get better prices if you’re the first buyers of the day. 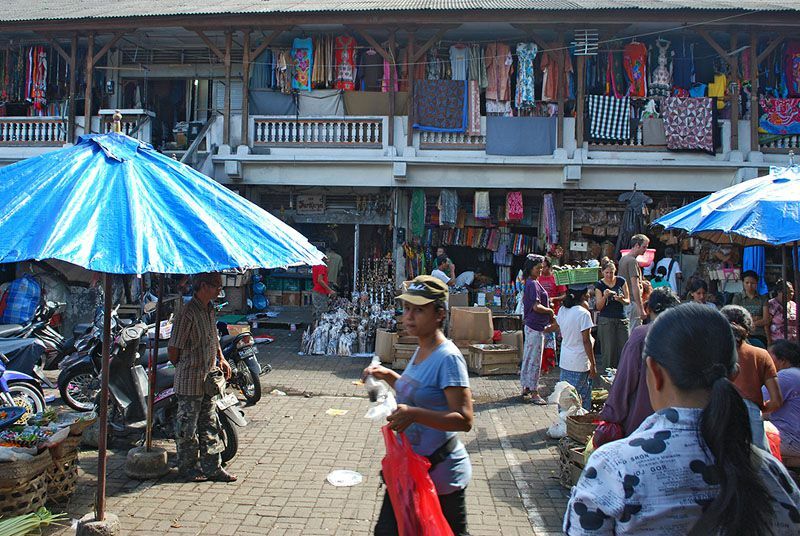 The “art market” is actually confined only to the western half of the sprawling market complex – the eastern part is Ubud’s traditional market, which is open by 4am and sells the town’s market basics, from meat to vegetables to home implements. Pro tip: if you stop at any stall, the seller will try to keep interested for as long as possible – do not mistake this persistence for aggression. If being pestered and pursued by vendors isn’t your thing, then just walk on over to Jalan Monkey Forest and the boutique stores therein. The boutiques’ prices are fixed, and the merchandise is far more pricey, but the shopping experience there is far more refined (if that’s your sort of thing). Hinduism in Ubud is quite syncretic, with plenty of input from animism and Buddhism. The religious artwork on sale in the Ubud art market reflects the local faith community’s eclectic beliefs: Buddha heads make a strong showing among the art stalls. You can also find a number of other religiously-inspired artwork as you comb through the merchandise: you’ll find topeng masks, statues of Hindu deities, and costumes among the hundreds of displays in the market’s two levels. The Ubud art market also sells more everyday religious items for locals, including (but not limited to) ingredients for making canang sari, those little offerings to the spirits you’ll find anywhere you go in Bali. For some context on canang sari, read our articles on Balinese culture and etiquette tips for visitors to Bali. This fragrance stall near the Ubud market entrance sells a variety of natural scents and essences in oil, cologne and soap forms. Ubud Art Market caters to a natural-minded tourist target market, which is attracted to local, natural, homemade products. Ubud’s craftsmen and artisans are happy to oblige. Ubud Art Market also sells plenty of batiks, sarongs, and assorted clothes, but in quantity, scope and price, you’ll get better deals on clothes when shopping in South Bali. Pro tip: don’t buy the first thing you like at any stall. Look for other stalls selling similar items and compare prices. This gives you some leverage in haggling lower prices for your purchases (“the next stall over sells this cheaper!”) and exposes you to alternatives that you might not have otherwise considered. Skilled craftsmen from the nearby town of Mas sell their wares in the Ubud Art Market – tourists on a budget can buy their carved products for about half or a third of the price you might pay when shopping in South Bali. The picture frames for sale in the Ubud Art Market, for instance, are almost as intricate and finely-executed as the actual paintings. The late Antonio Blanco of the Ubud Blanco Museum was himself a big believer in the “big picture”, paying as much attention to the look of the picture frame, choosing frames that complemented the artwork within it. You'll find plenty of finely-crafted jewelry in Ubud, too - but you need a practiced eye to know if you're getting actual value for your money. The jewelry finds in Ubud Art Market require careful examination, but bring some patience and legwork and you’ll be amply rewarded with bling that will be the envy of your neighborhood once you get home. You may have better luck at getting a lower price with the stalls upstairs, though – they don’t get nearly as many visitors as the stalls downstairs, so you may have some leverage with them when haggling for lower prices. Bali's Regions & Best Beaches, Decoded!